No point throwing a tantrum. You’re having a bath. I mean just look at your arms! They arrive fresh faced, well meaning and understandably on edge. They leave jaded, weary and changed forever. Platoon is an excellent Vietnam movie that is more about the battle within the battle, the two very different sides of the group of soldiers and what makes them tick. Private Taylor (Charlie Sheen) arrives as one of the rosy cheeked rookies and is immediately thrown into the thick of things. The Vietnamese jungles are dense, difficult and dangerous even before the other guys start shooting at you, with bugs, snakes, the elements and harsh terrain all conspiring to do you ill. The usual rules apply too; don’t show a photo of your ‘special girl back home’ and definitely don’t discuss ‘how few days’ you have left. Add to this the well drilled and especially determined enemy soldiers and it is little wonder that every soldier tries to deal with the constant barrage of their nerves and senses in different ways. One group is the ‘get bys’, where soldiers gravitate to methods that ‘remove’ them from the harsh reality; read – Drugs. Lots of drugs. These like minded individuals aren’t really ‘lead’ by anyone, but their highest ranked member is Sgt Elias (Willem Dafoe). The other group are the ‘get somes’, they opt to embrace the difficult situation rather than avoid it, aside from the occasional drowning of thoughts with alcohol. This group seem far more dangerous to both themselves, the enemy and anyone who stands in their way. This group is indisputably lead by Sgt Barnes (Tom Berenger) and is full of toadying yes men who kowtow to his will, including Sgt O’Neill (John C. McGinley) and a Private known simply as ‘Bunny’ (Kevin Dillon). The difference between the two groups is chillingly evident in the shake down of a small village which may or may not be assisting the NVA. As the soldiers move through the village and utilise their methods of questioning and interrogation, incidents occur with far reaching consequences for all involved, meaning Taylor must choose a side within a side very quickly. 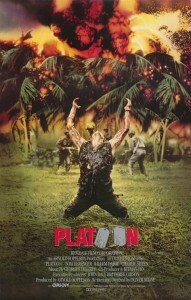 Platoon is very dramatic, sometimes melodramatic. It is chock full of big name actors at the top of their games, all trying to one up each other. The dialogue is often full of that boastful crap with macho taunts and ridiculous insults. I understand that some soldiers really speak that way but all of them? In moments where the intensity is ratcheted up so to is the importance of the dialogue, with some coming across more like a carefully prepared speech than impassioned conversation. Director Oliver Stone might never have instructed someone on one of his filmsets to ‘go smaller’, and it’s amazing that Platoon had such a small budget given how ‘big’ it all looks. Some of that is because of the power of the performances, Berenger chews scenery while Dafoe surveys everyone in his inimitable steely glare. Some is the accompanying music that enhances the power onscreen – never more evident than in the immortal and oft-parodied moment when a fleeing soldier is finally brought down in a hail of bullets. The finale is similarly large in both scale and bodycount, with a bloodbath that leaves immense casualties on both sides – not all killed in ‘acts of war’. In fact if nothing else this film illustrates the difference between justice and war. Final Rating – 8 / 10. Platoon ultimately is about events that occur within the framework of the Vietnam war while not necessarily being war time events. It tells the tale exceptionally well, it has merely chosen to go down a different path than both Hamburger Hill and Full Metal Jacket. A path that highlights the importance of ‘moments’ rather than the inexorable grind of warfare.